Headache in the postpartum period is common and multifactorial in origin. Apart from primary causes such as tension headaches and migraine, secondary headaches such as post-dural puncture headache (PDPH) are increasingly common because of increasing use of regional anaesthesia and analgesia during childbirth. Preventive measures for PDPH include the use of smaller gauge pencil-point needles for spinal blocks; epidural needles of 18 G or less; using saline rather than air for epidural space identification and the use of ultrasound guidance, especially for difficult cases such as morbid obesity and spinal deformities. In case of accidental dural puncture (ADP), the choice is between inserting the catheter in an adjacent space or intrathecal catheterization. Current evidence seems to be in favour of inserting the epidural catheter into the subarachnoid space and using the intrathecal catheter for analgesia/anaesthesia after prominently labelling it as intrathecal, to prevent misuse. It should be removed after at least 24 hours and a 10 ml bolus of saline injected before removal of catheter may be helpful. Either way, having written protocols for the management of accidental dural puncture helps to reduce the incidence of PDPH. PDPH can be disabling in severity and can mar the whole experience of childbirth. In addition, severe untreated PDPH can cause complications such as nerve palsies, subdural hematoma and cerebral venous thrombosis. Conservative methods of treatment should be tried first such as adequate hydration, paracetamol, caffeine, sumatriptan or ACTH/hydrocortisone. Epidural blood patching is the most effective treatment for PDPH. It is more effective if done 24-48 hours after dural puncture. It is an invasive procedure with its own complications as well as a failure rate of up to 30%, so that a second or even third patch may be necessary. Both these facts should be intimated to the patient beforehand. Meticulous follow-up and evaluation of these patients is an important responsibility of the obstetric and anaesthetic team. Persistent headache, loss of the postural nature of the headache, altered sensorium, onset of focal neurological deficits and seizures are all features necessitating further investigation including neuroradiological imaging. 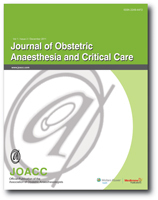 Aims: Spinal hypotension using conventional local anesthetic doses for elective cesarean delivery (CD) has been associated with fetal acidosis. The optimum anesthetic technique for laboring women with nonreassuring fetal heart trace (FHR) and its effects on neonatal outcome has not been well studied. Materials and Methods: Thirty laboring parturients with a nonreassuring FHR undergoing emergency CD (category 2) were included in this study. The parturients were randomized to receive a low-dose spinal anesthesia (LDSA group) 8 mg hyperbaric 0.5% bupivacaine with 20 μg fentanyl, or standard general anesthesia (GA group). 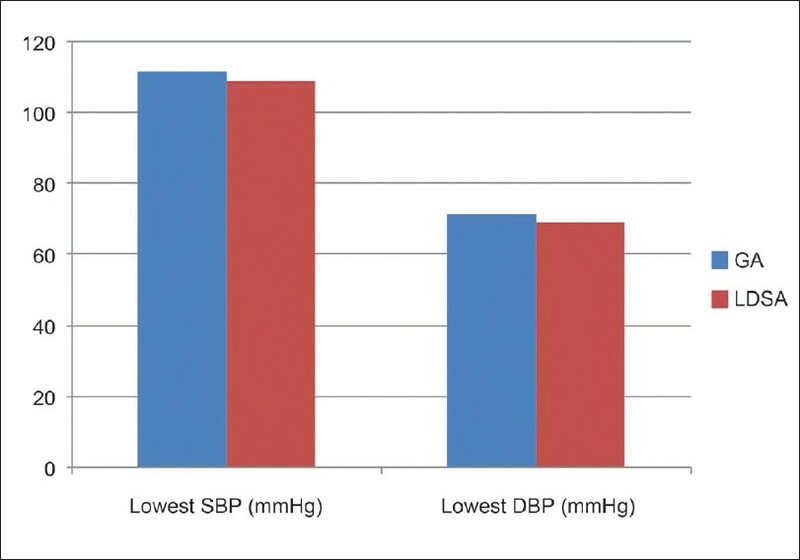 Systolic blood pressure was maintained at >100 mmHg till delivery of the fetus using phenylepherine boluses. The primary outcome variable was cord blood gas base excess >8 meq/L. Statistical Analysis: Assuming an SD of 7.5 and difference of 5 as clinically significant difference in base deficit, we required 15 patients in each group with α of 0.05 and power of 90%. Student's t test, two-way repeated measures analysis of variance (ANOVA) and Chi square test were used to analyze the data. Results: The incidence of fetal acidosis was higher in the GA group. Lower APGAR scores at 1 and 5 min and a greater need for immediate resuscitation was observed in fetuses exposed to GA. All patients in the LDSA group achieved adequate surgical block as well as stable hemodynamics. No adverse event was observed with either of the techniques. Conclusion: A LDSA is associated with better neonatal outcome in women with nonreassuring FHR as compared with GA.
Introduction: Maintenance of body temperature of obstetrical patients undergoing cesarean section is complicated by a variety of factors including heat loss to atmosphere, infusion of fluids at room temperature, disruption of thermoregulatory mechanisms by epidural or spinal anesthesia and redistribution hypothermia. Infusion of warm fluids is an important method of heat conservation. 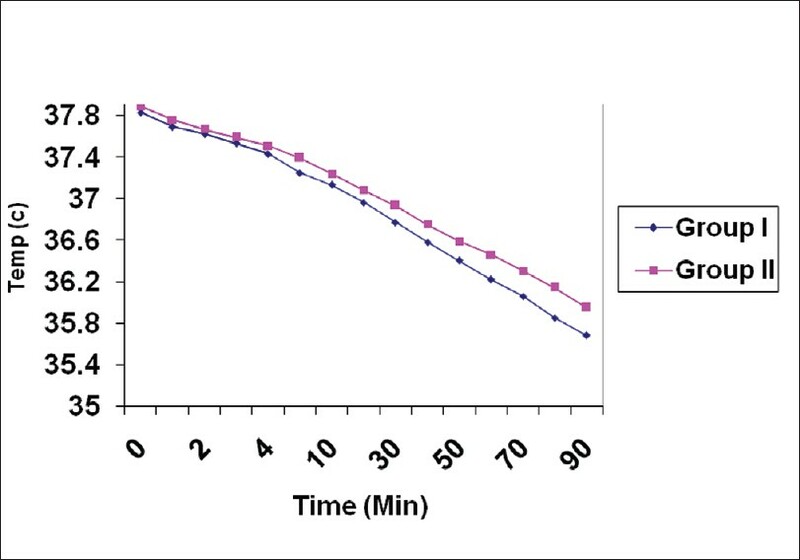 Hence, we evaluated the efficacy of intravenous fluid warming in preventing hypothermia by observing the change in core temperature with intravenous fluids at room temperature (22°C and 39°C) in patients undergoing lower segment cesarean section under spinal anesthesia. Materials and Methods: Sixty-four patients belonging to ASA grade I and II were randomly allocated to either of the two groups. Group I received intravenous fluids at room temperature (22°C) and group II received intravenous fluids via fluid warmer (39°C). Core temperature was recorded at every 1 min for the first 5 min, followed by 10 min till the end of surgery using a tympanic thermometer. Results: The mean decrease in core temperature in group I was -2.184 ± 0.413 and -1.934 ± 0.439 in group II. The comparison of group I and II showed a statistically significant difference in mean core temperatures at times 5, 50, 60, 70, 80 and 90 min and immediately on arrival in the recovery room. A lower incidence of shivering was seen in group II patients, but the difference in the two groups was not statistically significant. Conclusion: Infusion of warm intravenous fluids resulted in a lesser degree of fall in core temperature, thereby providing a significant temperature advantage; however, this did not translate to prevention of postoperative shivering. Clomiphene citrate is a nonsteroidal estrogen analogue that is commonly used for ovulatory dysfunction in the treatment of female infertility. To our knowledge, this is the first case report to describe a relationship between clomiphene use and maculoerythematous rash and severe thrombocytopenia. 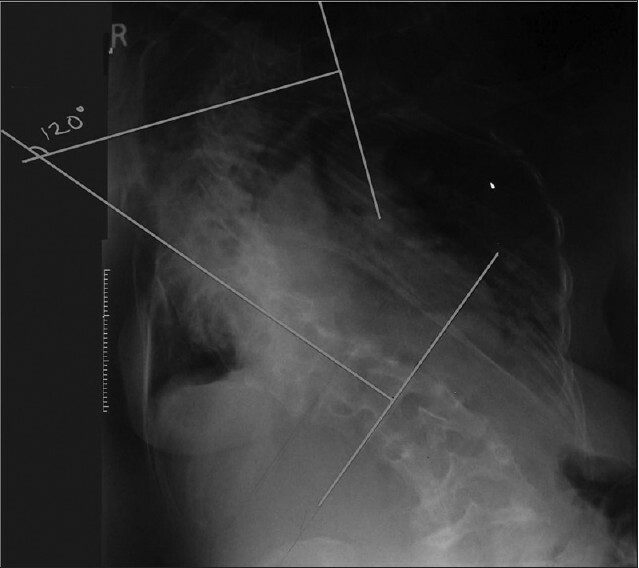 We present a case of a primigravida with kyphoscoliosis and pneumonia posted for emergency cesarean section. She had a Cobb's angle of 120° and exertional dyspnea. Epidural anesthesia was successfully used for anesthesia and postoperative analgesia. This report highlights the anesthetic challenges and the importance of early planning of anesthetic technique for successful intraoperative management of a kyphoscoliosis patient. Misoprostol, a synthetic prostaglandin E1 (PGE1) analogue, although not the first-line drug in the management of postpartum hemorrhage, is frequently used for this purpose due to its safety profile and cost-effectiveness. Cardio-pulmonary complications have been previously reported with use of prostaglandin analogues but not with misoprostol. We describe a case of pulmonary edema after the use of vaginal misoprostol for treatment of postpartum vaginal bleed in an otherwise healthy asymptomatic patient, who was later diagnosed as a case of peripartum cardiomyopathy. Approximately two percent of women undergo non-obstetric surgery during their pregnancies. The following case report describes the anesthetic management of a super obese parturient in her third trimester of pregnancy undergoing urgent laparoscopic (converted to open) bowel resection. Such a case, which has not been previously reported, has multiple clinical implications for both mother and fetus and was further complicated by super obesity (BMI>50) and laparoscopy. The anesthetic implications for this patient population are reviewed. Severe ovarian hyperstimulation syndrome (OHSS) is characterized by increased capillary permeability and fluid retention in the third space. It is generally a complication of assisted reproduction therapy (ART) with exogenous gonadotropins, but cases with natural onset of OHSS have been reported. The massive extravascular exudation can cause tense ascites, pleural and pericardial effusion, hypovolemic shock, oliguria, electrolyte imbalance (hyponatremia and hyperkalemia), and hemoconcentration, with a tendency for hypercoagulability and risk of life-threatening thromboembolic complications. The patient can rarely develop multi-organ failure (adult respiratory distress syndrome, renal failure) and death. With increasing use of ART, this syndrome may be seen more frequently in the intensive care unit (ICU), requiring multidisciplinary care. We report the management of two cases of severe OHSS, which required admission to the ICU in our hospital.